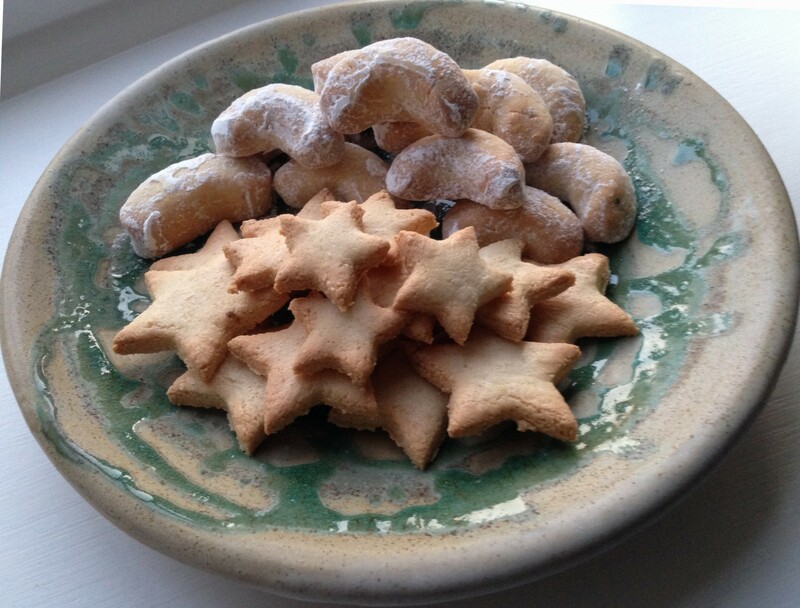 These are traditional Christmas biscuits popular in Germany and my friend Ela at Love to Craft makes them every year. They are so good that after I tried them last week I had to ask for the recipe. They may take a little time and effort to make but if you are making one you may as well make the other at the same time: the stars need an egg white and the crescents need a yolk. 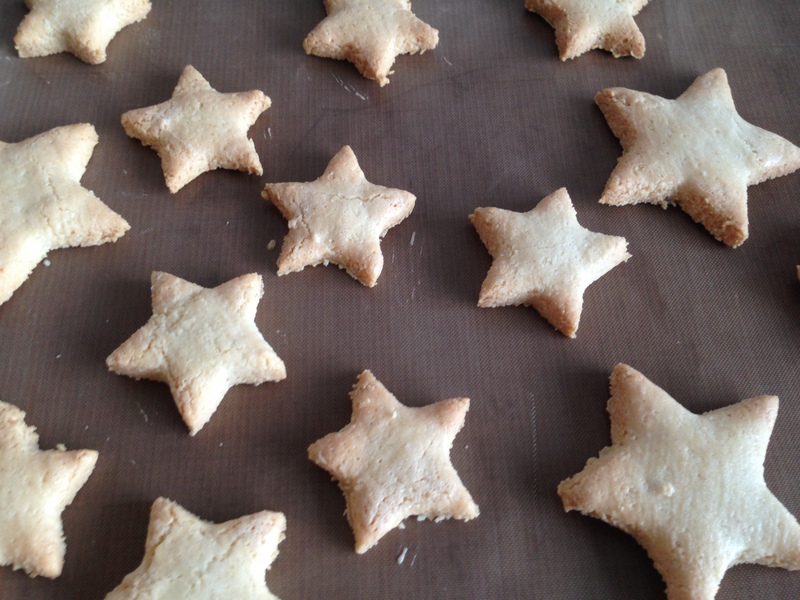 The stars, or zimt sterne, have a chewy consistency and the crescents, or vanille kipferl, are very similar to shortbread biscuits. My cinnamon stars should actually have a white layer on top that looks just like icing: if you search images of cinnamon stars you will see exactly what I mean. I didn’t fully understand what the recipe was telling me when I made them and thought I would be icing them at the end. In fact a little of the almost meringue-like mixture is kept back to glaze the biscuits and this is what gives them the topping. Either I didn’t use nearly enough to glaze them or I just hadn’t whisked my eggs and sugar enough because mine are almost entirely lacking the typical white topping. Luckily they still taste authentic! Set the oven to 150ºC. Beat the egg whites and slowly add the icing sugar while beating. Set aside about one tablespoon of the mixture. Fold the almonds and cinnamon into the remaining egg white mixture. 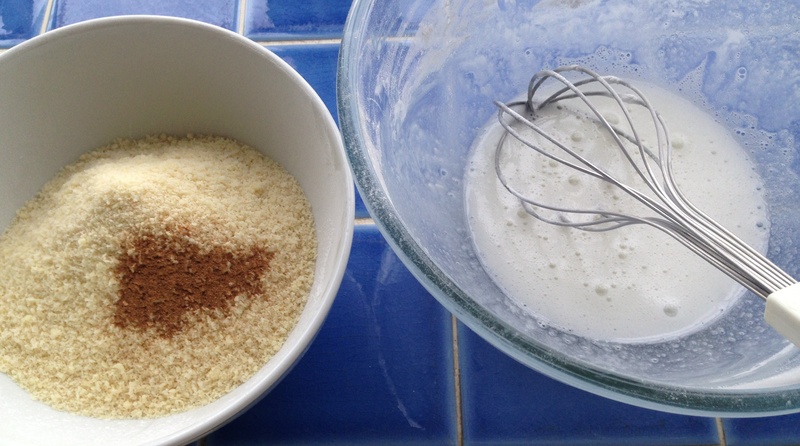 Sprinkle some ground almonds over a piece of baking parchment and tip the mixture onto it. Sprinkle the dough with some more ground almonds and cover it with another piece of baking parchment. 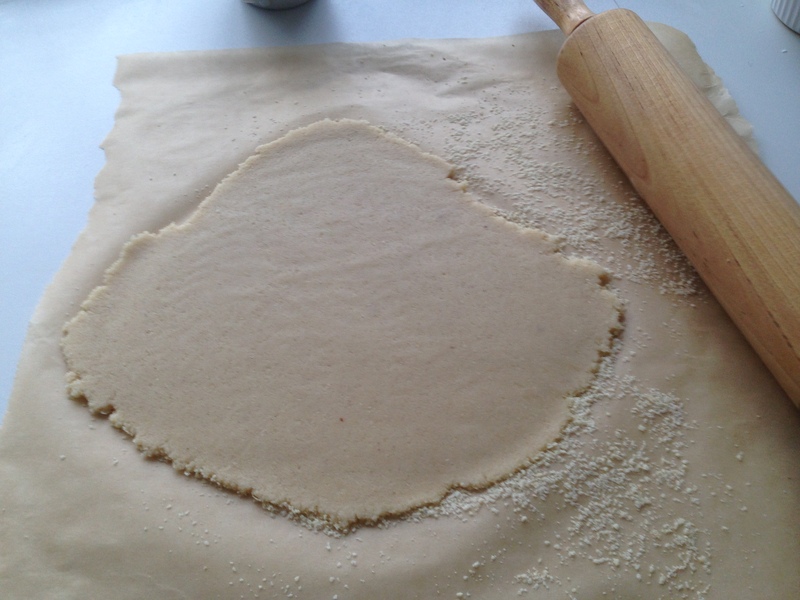 Roll out the dough until it is approximately half a centimetre thick. Let it rest for around 10 minutes. 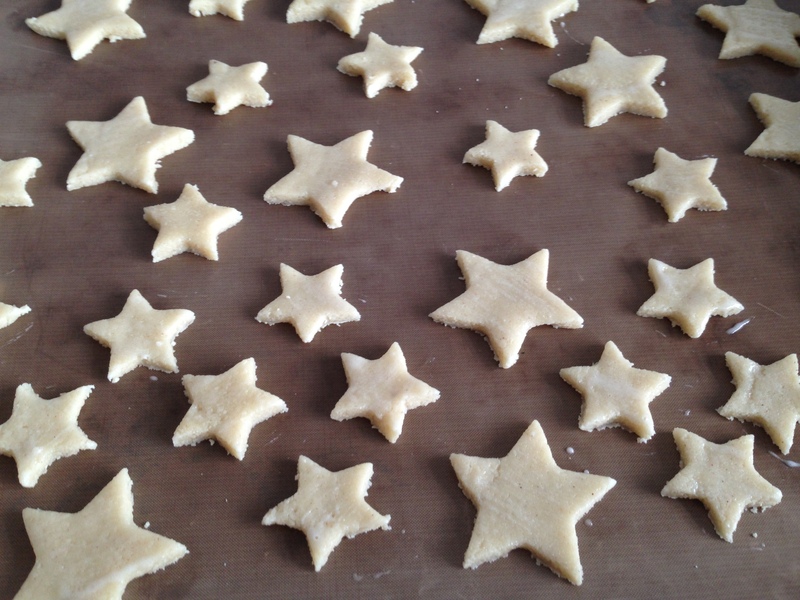 Cut out stars with a cookie cutter and transfer them to a baking tray lined with baking parchment. Using a pastry brush, glaze the stars with the reserved egg white mixture. 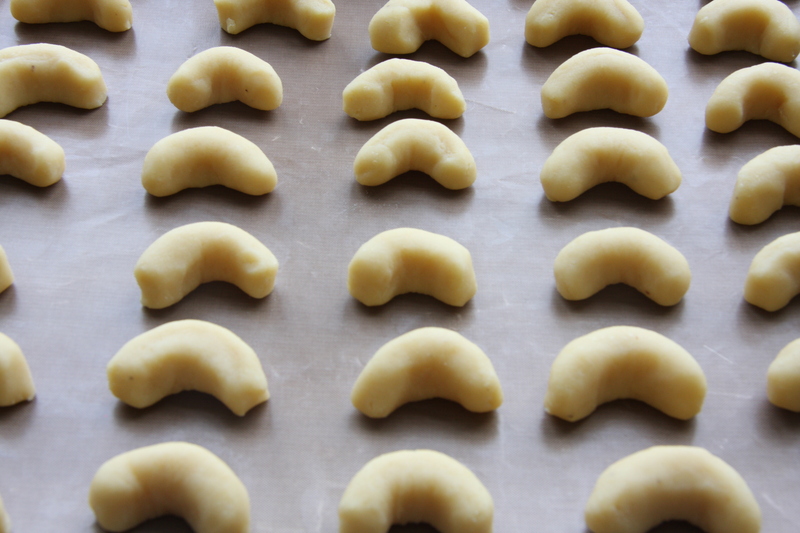 Ready to bake – they just need more glaze! Bake for around 15-20 minutes. Remove to a wire rack to cool and keep in an airtight container. Delicious even without the proper white glaze! Mix together the flour, almonds, sugar, egg yolk and butter using a stand mixer or hand-held beaters to form a smooth dough. Shape into a couple of evenly shaped rolls, wrap in cling film and refrigerate for about 30 minutes. Set the oven to 170ºC. Cut the rolls into slices of approximately 1 centimetre, roll the slices into a sausage shape and then curve into a half moon shape. Put onto a baking tray and bake for around 15 minutes. 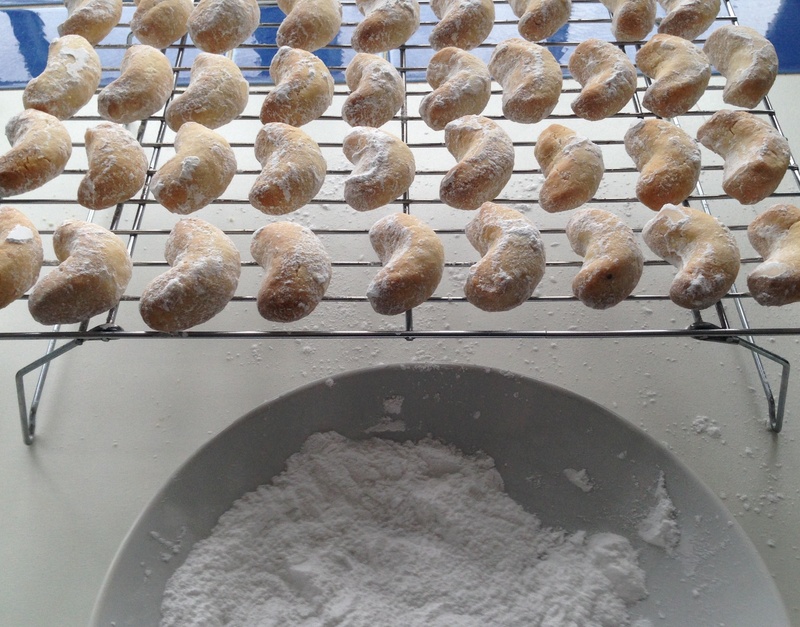 While the crescents are in the oven mix the icing sugar with the seeds of the vanilla pod. When they have completely cooled they can be kept in an airtight container. Happy Christmas to Ela and if you are interested in all things craft-y, check out her lovely blog! Thank you – have a lovely Christmas! 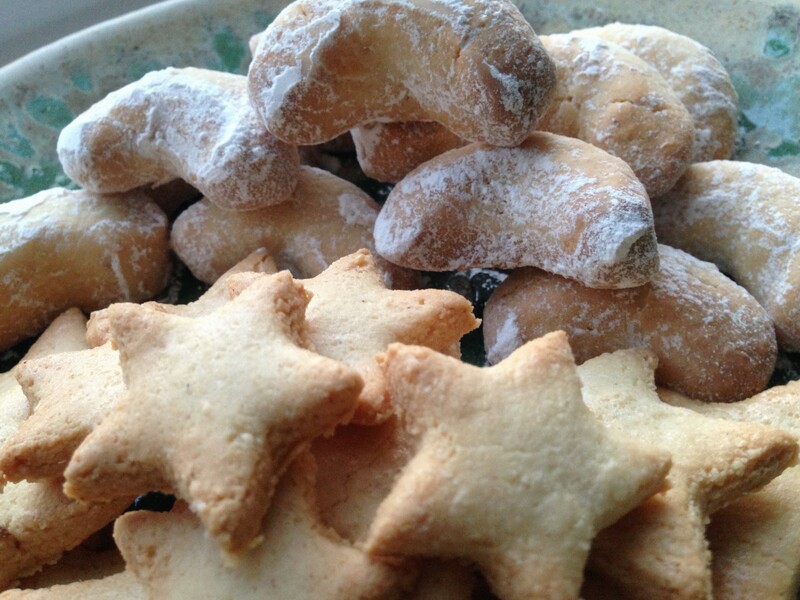 I’ve recently made a batch of vanilla crescents too.. Love its melt in the mouth texture! Yours look really neat! Thank you – hope you enjoyed yours too! I love the flavors of the holidays! It is fun to see the traditions of others and to sometimes even give them a try. I know, it’s great to try out different things. Hope you’re enjoying the holidays! My mother used to make the crescents. I can taste them now! So we have just returned from a wild and windy clifftop walk and attempted to make the Crescents although whilst half the mixture is resting in the fridge, the other half had to be cut and cooked and consumed by hungry hoardes almost before the tea had been poured – and divine they are too. The cinnamon stars are in the oven now as we had to hunt for more almonds to crush up (in the coffee grinder!!) to roll out the sticky dough. No chance of a photo because they were gone in a flash…..!